Tina is the Shields Chiropractic office manager and has been with Shields Chiropractic since 2006. Tina grew up in Wisconsin and is an avid Packers fan! She earned her diploma in Chiropractic Technology from the Palmer College of Chiropractic, School of Technology in Davenport, Iowa. Tina is passionate about chiropractic and has worked in the chiropractic field for over 30 years. Tina resides in Saginaw with her husband and children. Together, they have five children and three grandchildren. Briana was born in Muskegon, MI and was raised in Saginaw. She is 24 years old and lives with her husband, John, and two handsome kitties, Moo and Ziggy. Bri graduated from Heritage High School and attends Delta College. Bri enjoys spending time with her friends, listening to music, and painting. Bri has been at Shields Chiropractic for one year as a Chiropractic Assistant. She is cold laser certified and trained in the application of rock tape. Bri’s favorite thing about chiropractic is that she helps people feel better without the use of drugs. 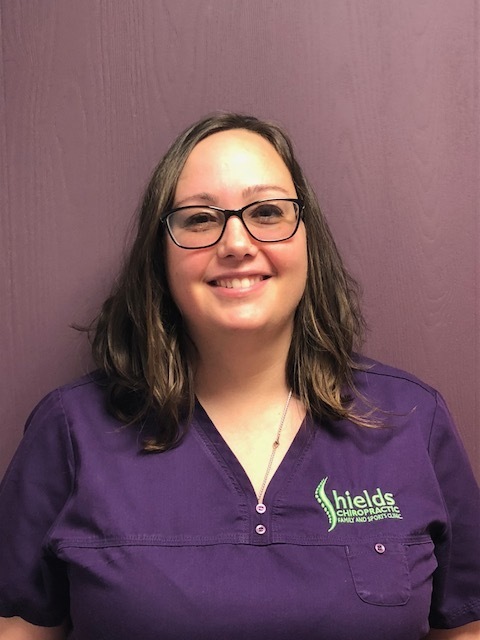 Elizabeth has been a front desk specialist at Shields Chiropractic since March 2017. She is certified in cold laser therapy and trained in the application of rock tape. Elizabeth is a Michigan native and currently resides in Saginaw with her grandparents and cats. In her spare time, she is an avid video gamer and enjoys spending time with her friends and family. Amber has been working in the healthcare field for eleven years. She has been with Shields Chiropractic as a Chiropractic Assistant for the past three years. Amber is cold laser certified and trained in the application of rock tape. In her spare time, Amber enjoys cooking, shopping, fishing and playing sports with her boys. Amber believes the greatest medicine is to teach people how they can heal naturally. Desiree graduated from Dorsey School of Massage in 2014. She has taken courses in pre-natal massage, sports massage, deep tissue massage, hot stone massage, and Swedish massage. Massage has always been a passion of Desiree’s, stemming from when she was growing up. Being able to assist others that need help healing their body allows Desiree to say how wonderful of an experience massage therapy has been for her. Ebony has been a Licensed Massage Therapist for three years. She loves helping and caring for those who are in need, mentally and physically. She is certified to perform sports massage, cold and hot therapy, hot stone massage, and Swedish massage. Ebony is a single mother of four beautiful children and is from the Saginaw area. Victoria has been a practicing Licensed Massage Therapist since 2006. She graduated from the Bayshire Beauty Academy in Bay City, Michigan. Victoria specializes in Reiki Massage, Instrument Assisted Soft Tissue Manipulation, hot stone massage, prenatal massage, deep tissue massage, essential oils, and sports massage. Sarah is a Licensed Massage Therapist that graduated from Dorsey School in Saginaw. She is certified in spa treatment wraps, scrubs, essential oils, sports massage, acupressure, reflexology, hot stone therapy, lymphatic and sinus drainage. She enjoys treating patients with migraines and helps her patients reach maximum relaxation. Sarah grew up on the carnival circuit until she was 28 and then decided to become a massage therapist. LaKendra has been a massage therapist for two years, graduating from Dorsey School ofMassage in 2016. She is a native to the Saginaw area and has a background in medical coding, billing, mechanical and electrical engineering, and massage therapy. She is certified in hot stones, Swedish massage, sports massage, chair massage, and prenatal massage. LaKendra enjoys working with patients that have low back and leg pain.